If we really want to get to know butterflies a little better, we need to encourage them to take up residence on our property rather than just stopping for a quick bite to eat. To achieve that, we need to think about providing the habitat they need throughout as much of their life cycle as we are able. Let’s look at the Great Spangled Fritillary as an example. 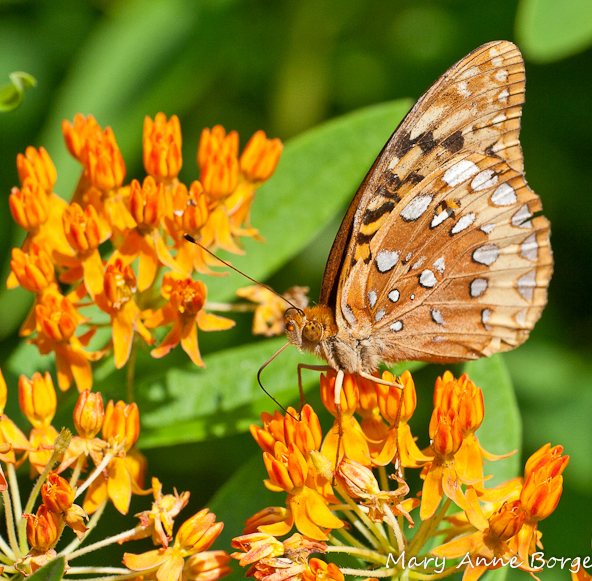 Adult Great Spangled Fritillaries love to cruise fields, meadows, open woods, and gardens, looking for nectar rich flowers. Some of their favorite food sources include Butterfly-weed (Asclepias tuberosa), Common Milkweed (Asclepias syriaca), Wild Bergamot (Monarda fistulosa), Joe-pye-weeds (Eutrochium dubium, E. fistulosum, E. maculatum, E. purpureum), Ironweeds (Vernonia sp. ), and Dogbanes (Apocynum cannabinum). These plants all have broad appeal to many species of butterflies, including the showy bright orange and brown Fritillaries. But if we’re interested in witnessing more of the Fritillary’s life, maybe watch while the female lays her eggs, and later look for the lovely chrysalis, we also need to provide the food plants her caterpillars need, and the habitat that will enable them to survive as they develop. Violets are among the flowers that should be included in your landscape if you want to entice some lovely butterflies, showy moths and industrious solitary bees to share your space. Violets rely on solitary bees as their primary pollinators, and they are also visited for their nectar by butterflies and moths. Fritillary butterfly species, including Great Spangled and Meadow Fritillaries, could not survive without violets. A showy black and white moth called the Giant Leopard Moth may also seek out violets as food for its caterpillars. In late summer, usually late August into September, the female Great Spangled Fritillary will look for places to lay her eggs. She will lay them singly, either on, or often near, various species of violets, which are her caterpillars’ food plants. 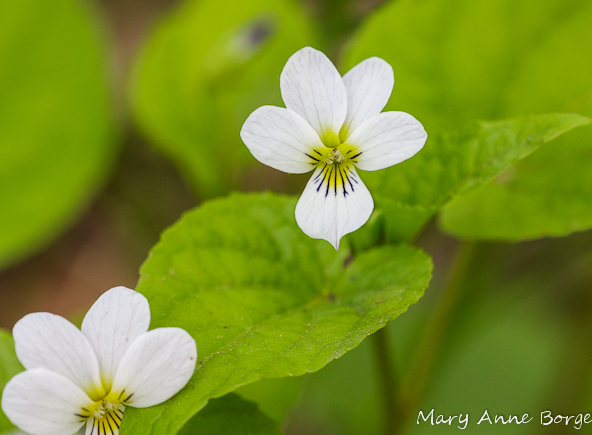 A few of the violet species the Fritillary caterpillars can digest are Common Blue Violet (Viola sororia), Downy Yellow Violet (Viola pubescens), and Canada Violet (Viola canadensis). There are many species of violets, and they hybridize freely, which can result in some interesting mixes if you have different species in proximity to one another. 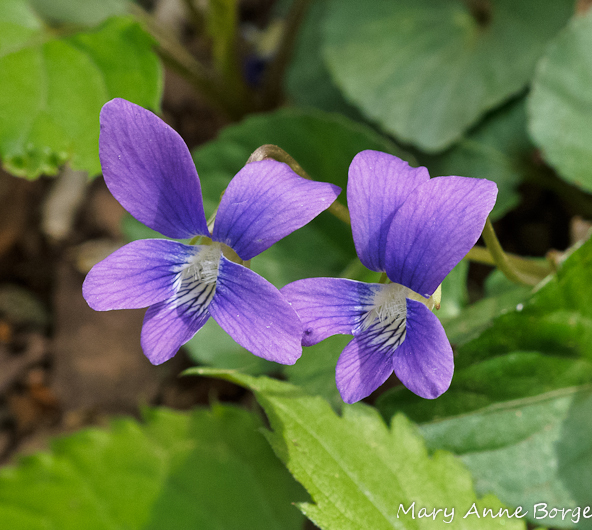 Violets mixed with other native perennials, ferns, and mosses make a beautiful, easy-care ground cover in shady places where growing a lawn is difficult. Within two to three weeks the eggs will hatch. The caterpillars emerge, and then quickly seek shelter in leaf litter, where they spend their winter diapause in this wonderful natural insulation. In spring, usually in May, the caterpillars emerge at the same time that the violet leaves unfurl. The caterpillars feed at night, again taking shelter in leaf litter by day. In June, they will pupate, with the chrysalis suspended by silk from a rock, log, low tree branch or bark. So leaf litter is another important element of the habitat required by Great Spangled Fritillaries. It’s also the best, most cost effective mulch you could use for your plants. Leaf litter will help control weeds. It will also absorb and then slowly release moisture from rainfall, helping to minimize the need for watering your garden, while at the same time minimizing soil erosion. As the leaves decompose, they provide essential nutrients plants need to thrive. This leaf ‘mulch’ is automatically replenished every year. Clearly, this is a ready-made excuse for cutting down on your yard work. And it’s free! Don’t worry about the caterpillars eating all of your violets. They won’t. Nature has a way of keeping things in balance. Violets are so determined to survive that they have two different strategies for reproduction. In addition to the showy flowers that produce and disperse seeds, violets produce a second set of flowers below their leaves. These flowers never open, and are self-pollinated. So violets reproduce readily. Remember, too, that caterpillars are a favorite food of birds, especially when feeding their young. 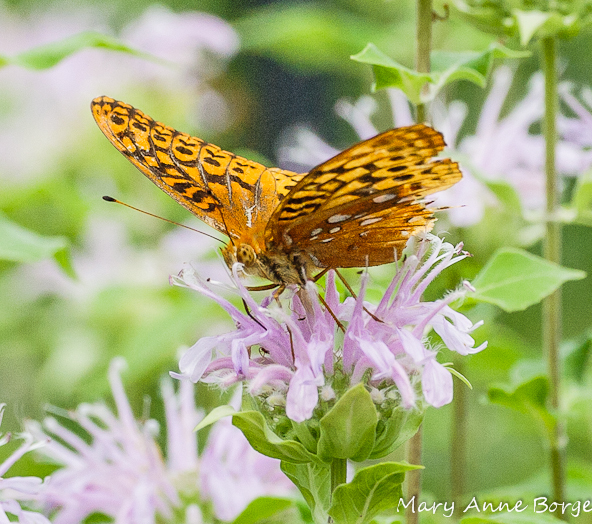 So what do we need to offer Great Spangled Fritillaries to entice them to make their home with us? We need a sunny spot with good nectar plants for adult butterflies. For their caterpillars we need plenty of violets, probably in a near-by shade garden or in woods. Those caterpillars also need leaf litter to protect them during winter and while they are developing the following spring. A rock or log might provide a pupation sight. What’s your favorite butterfly? How much of its lifecycle can it spend with you? 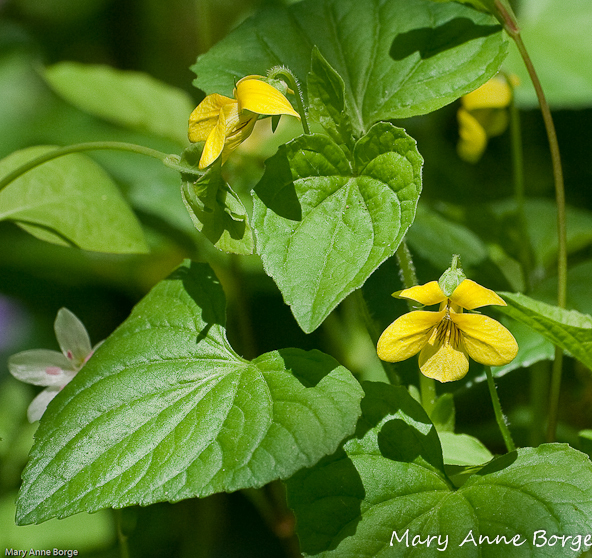 This entry was posted in Butterflies, Gardening for Wildlife, Native Plants and tagged Canada Violet, Common Blue Violet, Downy Yellow Violet, Great Spangled Fritillary, Leaf litter, leaf mulch, nature, Viola canadensis, Viola pubescens, Viola sororia by Mary Anne Borge. Bookmark the permalink. Great article! Thank you so much. Fallen leaves need a re-branding. People seem to really dislike leaves… this is just my humble opinion, but I wish we could call them fallen leaves because the really are the farthest thing from litter. We need to educate the public to love violets and fallen leaves! I like to call it leaf mulch, because it is, and it’s the best mulch you could use in your garden! Plenty of leaf litter and violets at my house. I do have small Fritillaries but not the Spangled. Sure hope she shows up…. Make sure there are good nectar sources nearby to increase your chances of seeing the Great Spangled. Milkweeds like Butterflyweed (Asclepias tuberosa) and Swamp Milkweed (asclepias incarnata) are always good bets, as are Joe-pye-weeds (Eutrochium dubium, E. fistulosum, E. Maculatum and E. purpureum) and even thistles.